Multisolvers are in abundance during the UN climate conference, and our FLOWERS from Paris project aims to capture the vision, breadth, and potential of their work. Those of you who follow our work on Multisolving know we believe those innovators who are finding ways to help their communities reduce emissions while boosting health, well-being, and equity are extremely important in the race to protect a livable climate. We have been learning about their extraordinary efforts via interviews and sharing examples of multisolving on our website. At COP 21, one of our primary goals is to collect more examples, to show the world what is possible when the need to respond to climate change is understood as an opportunity to create systems change. We are inviting visitors to our booth during COP 21 to complete one of our FLOWER diagrams, which we will post to our Flickr page as a special photo feature – FLOWERS from Paris. We are also making our own FLOWER diagrams in Paris, when we run into someone sharing the latest research on multiple benefits or showing what’s possible by multisolving in their communities, and we’ll post those to our Flickr page as well. 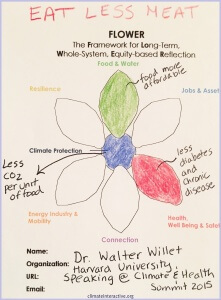 FLOWER diagrams show how some actions and investments protect not only the climate but also jobs, water, food, resilience, and health while also strengthening or healing our connection to each other and the earth. The diagrams show the range of co-benefits of a given solution, along with a picture of the fairness with which those benefits are distributed. Thus, FLOWERS from Paris aims to capture the potential for justice, as well as the health and wholeness we can create in our response to climate change. If you’re in Paris for COP 21, please stop by and give us a FLOWER! Otherwise, feel free to download instructions and a blank FLOWER diagram, and email it to us at multisolving [at] climateinteractive.org. Stay tuned for some visionary FLOWERS from Paris!